Pheochromocytoma in a 8 year old FS mixed breed dog. On first evaluation the original right adrenal gland was mildly heterogenous and slightly irregular in contour with minor increased capsular echogenicity. The right adrenal gland measured 3 x 2 cm. Cortical-meduallary distinction was lost. The adjacent vena cava in this image as well as in an oblique interrogation of the vena cava showed no invasion. 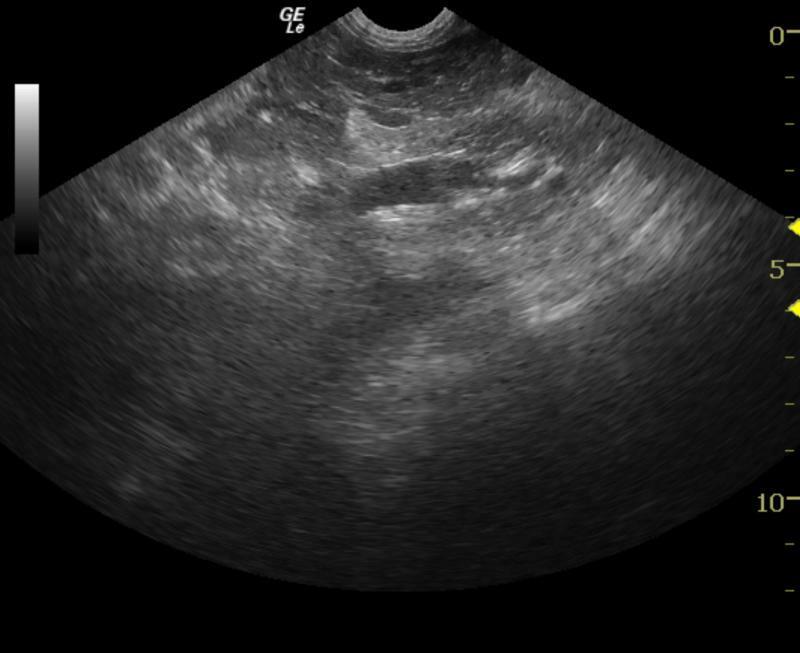 On ultrasound follow-up 2 weeks later, the right adrenal gland has increased in length which is now 4.3 x 1.8cm with a focal hypoechoic nodule with capsular impingement and progression of the echogenic peri-capsular ill-defined fat suggestive for associated inflammation and capsular stretch. This presentation is suggestive for right adrenal adenoma or possible emerging adenocarcinoma or pheochromocytoma. "Everyone wants to find a Pheo". 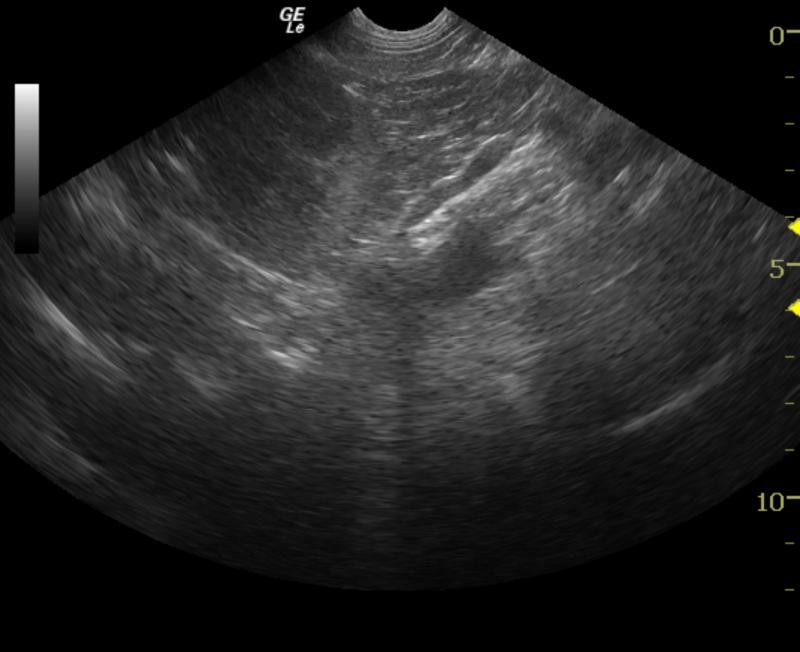 When chasing proteinuria and the "ADR" dog its amazing what the clinical sonographer will find. This is the story of Noelle, the little Labrador with the most dedicated owner on earth; which made Noelle the most scanned dog on earth (Q 2 months for 5 1/2 years). We found an emerging pheochromocytoma on a proteinuria hunt that bought Noelle a normal life span as opposed to an early demise. This case is one example of why we believe the sonogram to be the most proactive approach to anything "not right" in veterinary medicine. An 8-year-old FS mixed breed dog was referred for partial anorexia and mild lethargy. Mild painful cranial abdomen was noted on physical exam. CBC and chemistry panel were unremarkable. Urinalysis revealed 3+ proteinuria with isosthenuria. Blood pressure was 220 mm Hg. Pancreatic disease - pancreatitis, neoplasia. Renal disease - renolith, hydronephrosis, neoplasia, glomerulonephritis, early chronic kidney disease. Intra-abdominal neoplasia - liver, spleen, stomach. The left adrenal gland was normal size and contour (Image 1). 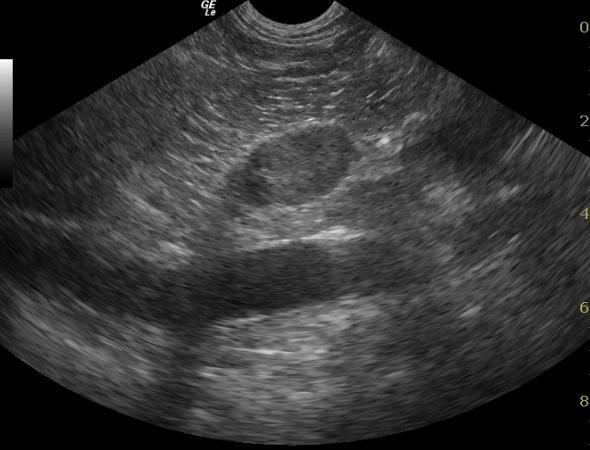 Preliminary imaging of the right adrenal gland was mildly heterogenous and slightly irregular in contour with minor increased capsular echogenicity (Image 2). The right adrenal gland measured 3 x 2 cm. Cortical-meduallary distinction was lost. The adjacent vena cava was imaged as well as in an oblique interrogation and the vena cava showed no invasion (Image 3). The right adrenal gland has increased in length which is now 4.3 x 1.8cm with a focal hypoechoic nodule with capsular impingement (Image 4). This is suggestive for right adrenal adenoma or possible emerging adenocarcinoma or pheochromocytoma which may be functional. Enlarged and nodular right adrenal gland, has increased in size with pericapsular reactive fat. Rule out adenoma, pheochromocytoma or functional adenocarcinoma. Given that growth has occurred right adrenalectomy would be recommended. The patient was referred to a board certified surgeon for an exploratory laparotomy. Pre-operative blood work was performed and the serum biochemical profile showed hyperphosphatemia, hypercholesterolemia. The CBC showed a neutrophilia, lymphopenia and eosinopenia. A right adrenalectomy and biopsy were performed. Recovery from surgery was uneventful, and the histological diagnosis was a pheochromocytoma. Hypertension and proteinuria resolved after surgical recovery. 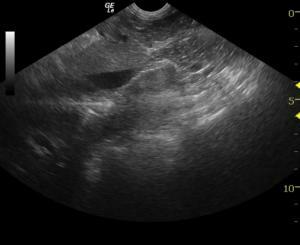 The patient did have recurrent chronic active pancreatitis that was medically addressed over the following 5 1/2 years. The patient was imaged by sonogram every 2 months for 5 1/2 years by owner request to ensure that no further metastatic disease had occurred. Noelle presented this month for progressive CNS signs, rapid weight loss and stage 3 renal failure. The latest abdominal and cardiac sonograms 5 days prior to this post again revealed no evident new pathology other than chronic renal disease and stable pancreatic changes. Due to non-response to medical therapy and suspected brain tumor after neurology consultation, Noelle was humanely euthanized Sept 5, 2013, 5 1/2 years post right adrenalectomy for pheochromocytoma. I would like to personally commend Noelle's owner for demonstrating a relentless dedication to her pet that is unprecedented in my career as a practitioner. I personally have never imaged any patient nearly as many times as I have Noelle - Eric Lindquist DMV, DABVP, Cert./Pres IVUSS. The right adrenal gland has increased in length which is now 4.3 x 1.8cm with a focal hypoechoic nodule with capsular impingement.